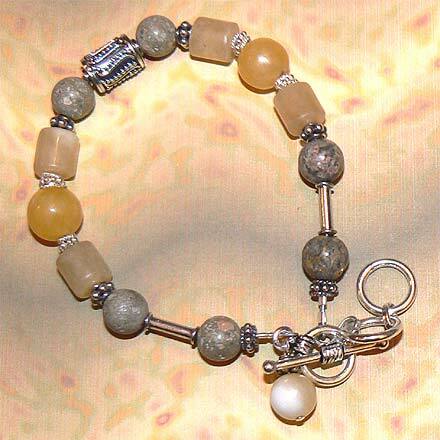 Sterling Silver Septarian Nodule, Aragonite, Calcite and Jasper Bracelet. 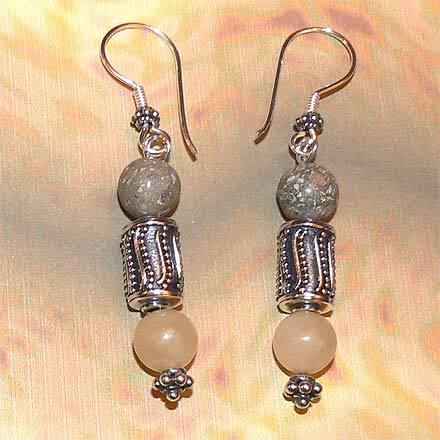 Sterling Silver Septarian Nodule, Aragonite, Calcite and Jasper Earrings. A Septarian Nodule is a Concretion comprised of sedimentary rock with the inner porous areas filled in with minerals. I bought my first Septarian Nodule in a rock shop in Moab, Utah, but didn't realize they could also be made into jewelry! Since most of the crystals in Septarian Nodules are made of Calcite and Aragonite, I have used beads made with them. The light yellow tube beads are Aragonite and the large dark yellow round beads are Calcite. The brown beads are Jasper, which have a very earthy quality like the "mud" matrix of the nodule. The bracelet is 7.6".